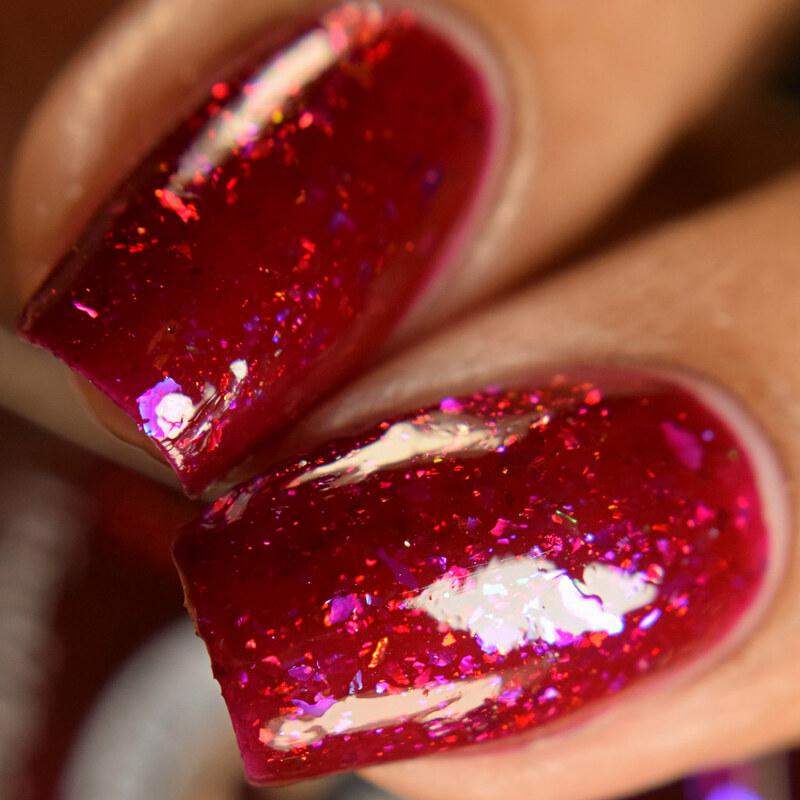 Hello nail geeks! Mage reporting for duty! 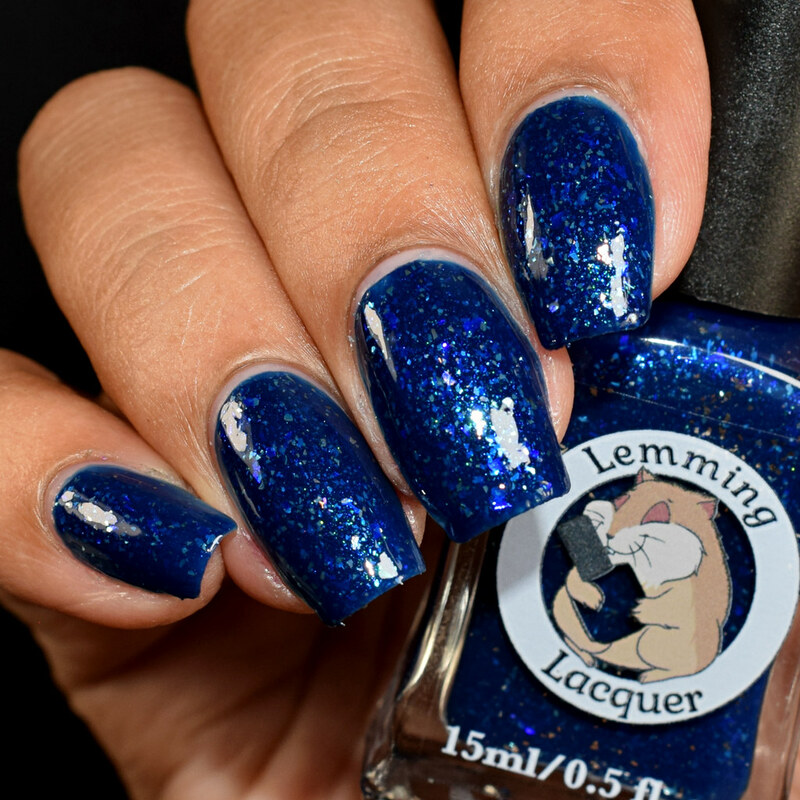 Lemming Lacquer brings us a new collection along with an awesome sale this weekend for Black Friday! 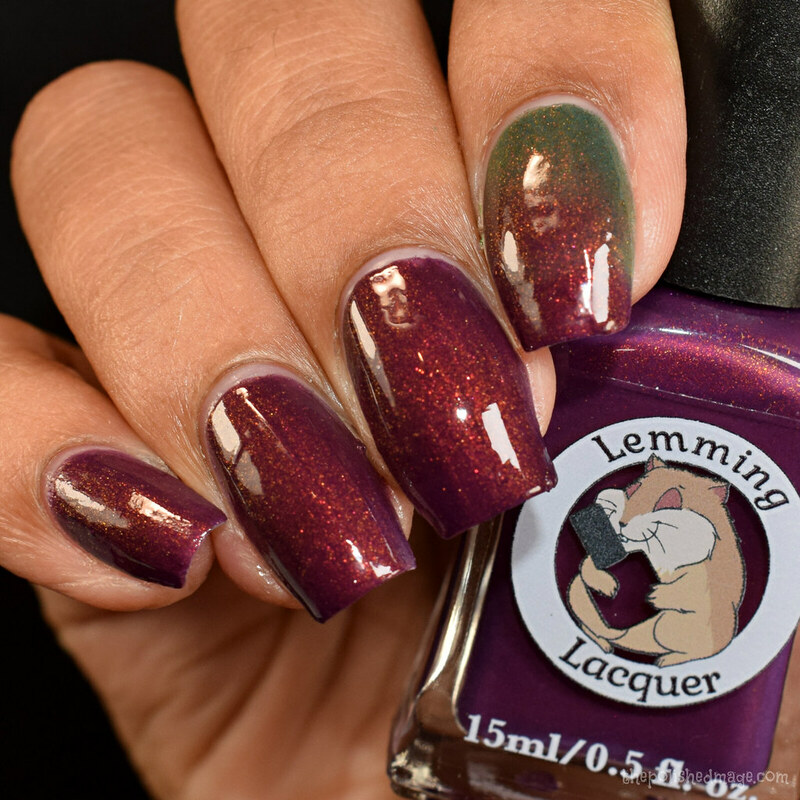 The School of Magic collection is inspired by the eight schools of magic in Dungeons and Dragons, and there are some serious magical shades in here! I am so glad I’m able to get this post up, my computer has had it with me this week apparently. Perhaps I need to look at a new PC this weekend? LOL. Let’s get to swatches and then sale info! 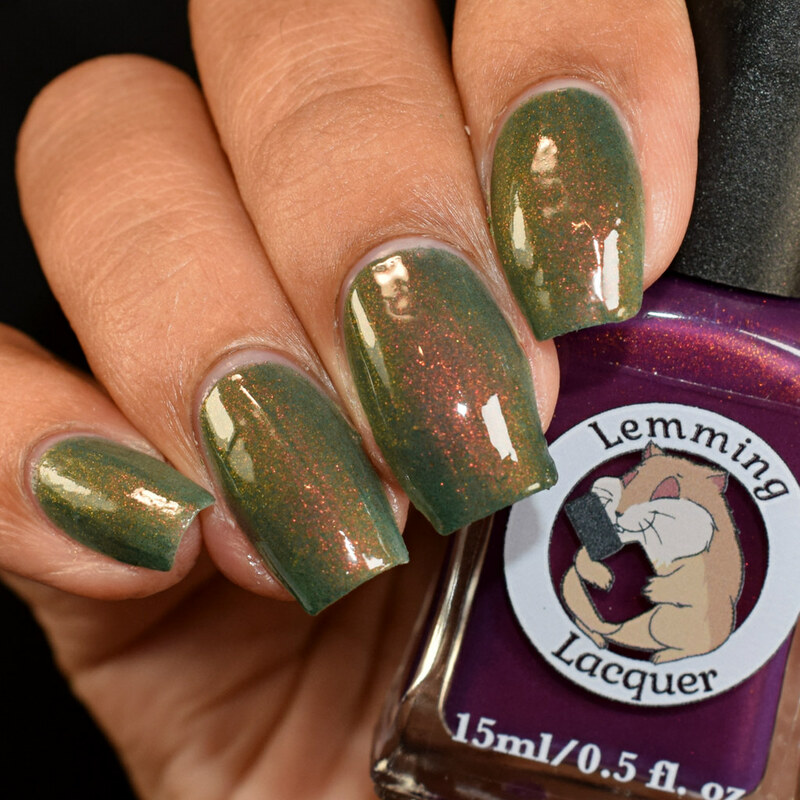 Necromancy- a gray crelly with bright green shimmer that shifts blue and purple at extreme angles. Swatches show three coats with topcoat. Formula has a buttery feel during application and I’d say most will get away with two coats. I have a few snags on my nails that I have had to repair this week so I went for that third coat to even everything out. The shimmer is strong and will appear as aqua in bright lights with a purple and blue shift on tilt. 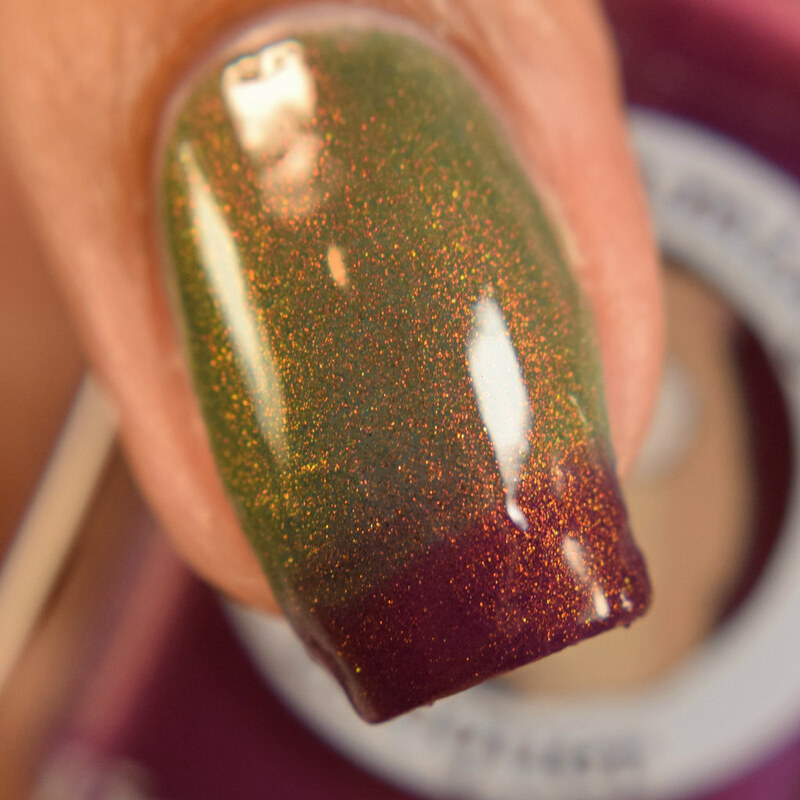 Conjuration- a rust red holo with gold/bronze microflakes and gold/copper/bronze iridescent flakes. Swatches show two coats with topcoat. This is such a lush color, and the formula felt buttery smooth during application. The microflakes picked up easily for me and laid down flat. There is a strong green almost shimmer like appearance in person, that mostly shows up as gold in every day lighting. 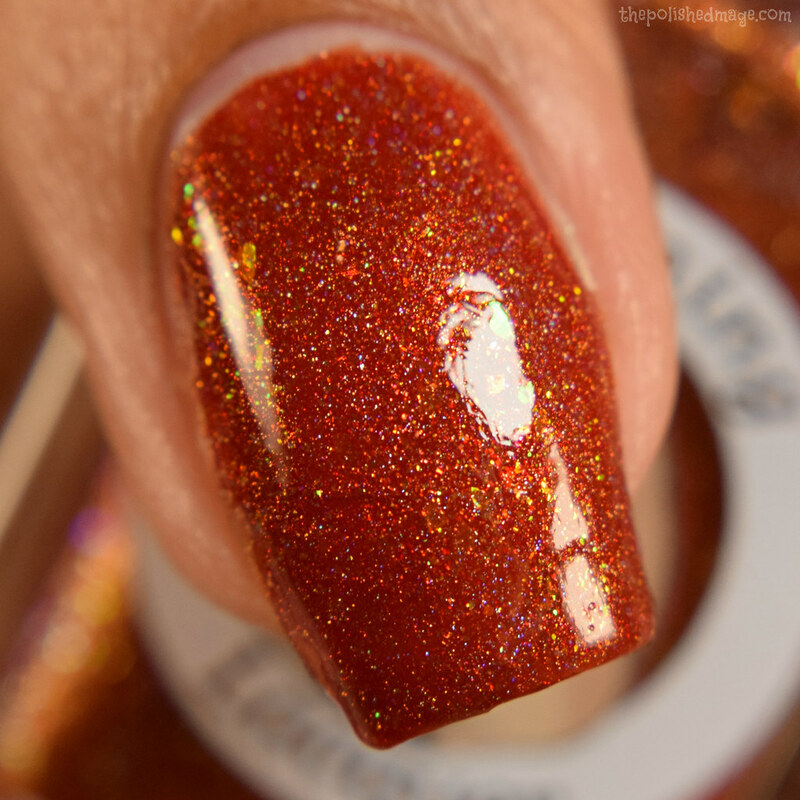 The holo is linear, and there’s sparkles everywhere! No texture after topcoat. 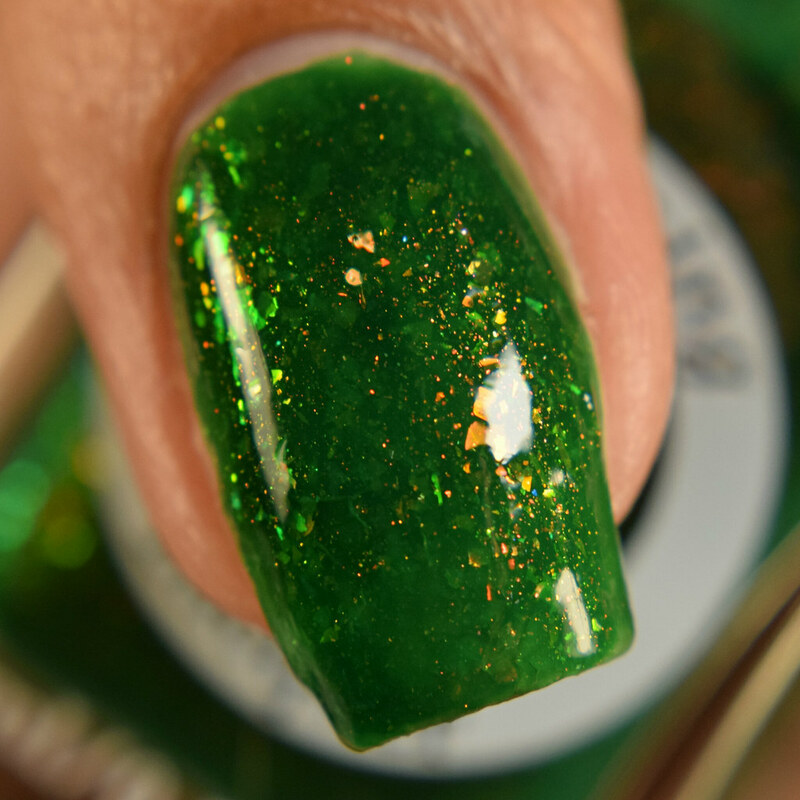 Evocation- a jungle green with orange microflakes and green/gold/orange iridescent flakes. Swatches show two coats with topcoat. 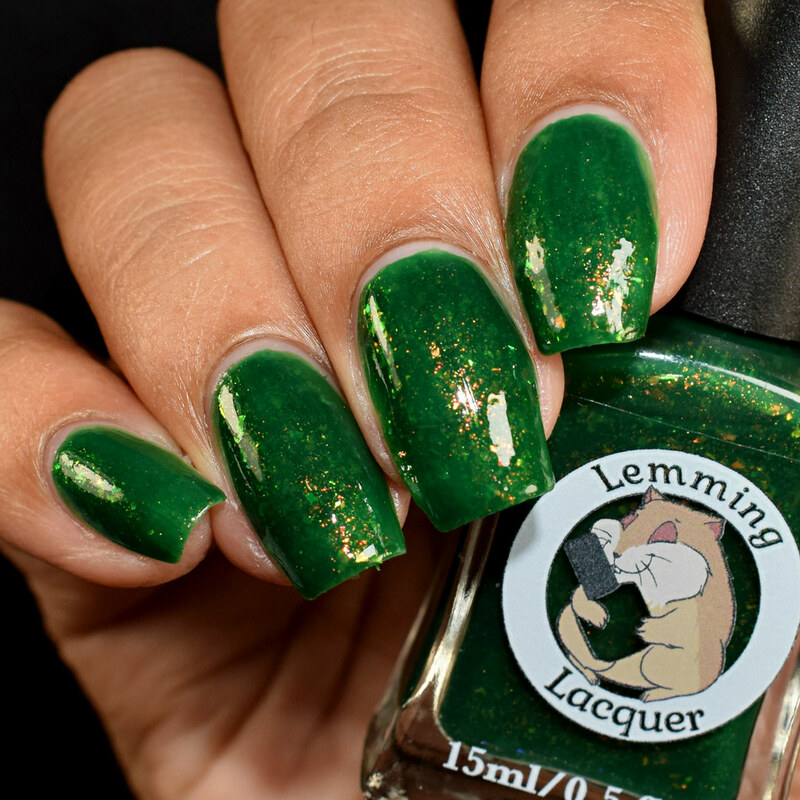 Formula has that same buttery feeling I’ve come to expect from Lemming’s jellies. It stays where you put it and builds easily. The flakes in my swatches are being a bit shy, but in person they’re strong and show up in the arrays of warm greens, golds, and oranges. No texture after topcoat. 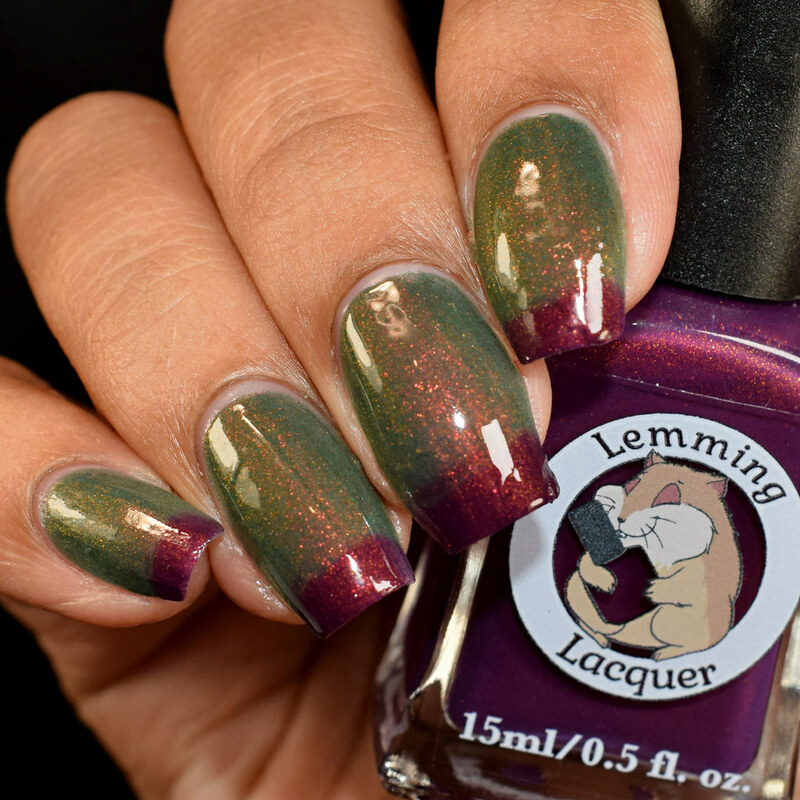 Transmutation- a purple to green thermal with gold/orange/red shimmer. Swatches show two coats with topcoat. 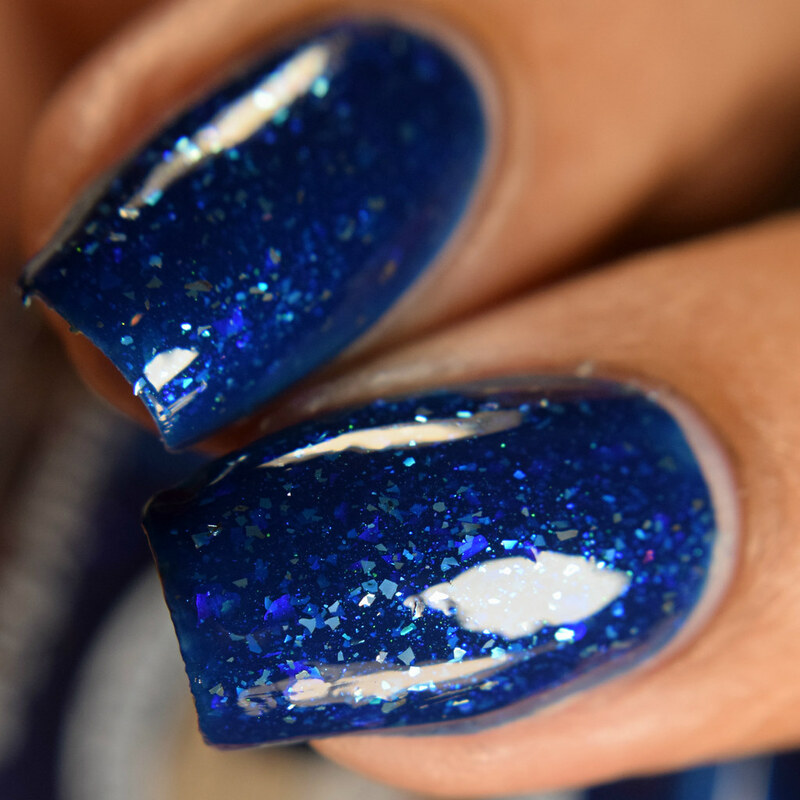 This one also has a very smooth formula and the shimmer is very strong. It mostly comes off as a reddish copper, and on tilt shifts to a bright gold and orange. The cold state is a lush, rich purple and the warm state is a sage green. 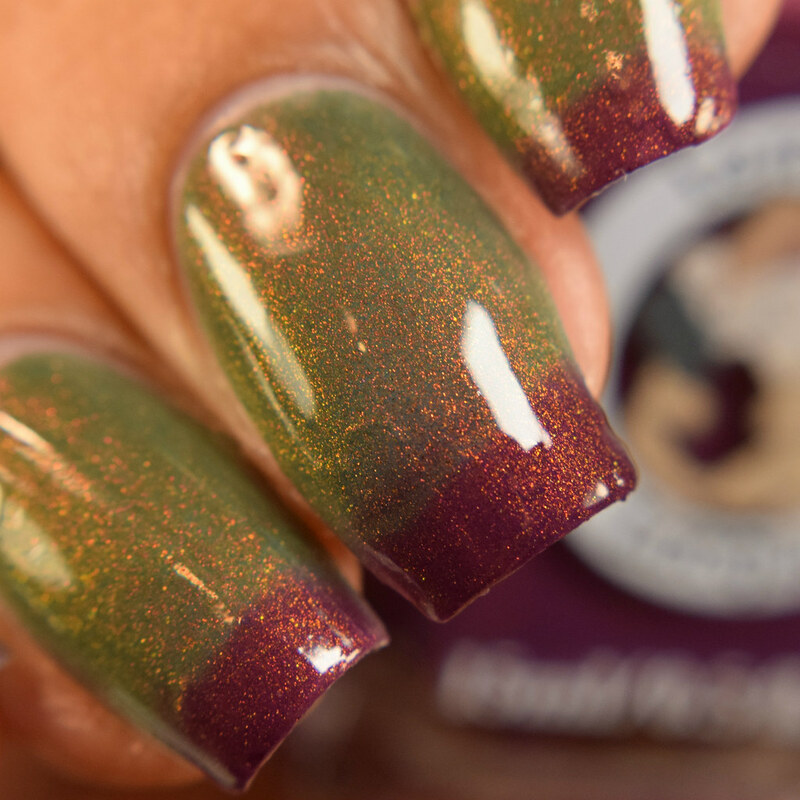 Both states are super flattering and the shimmer compliments both very well. Thermal properties are also very sensitive, it transitioned from the first few brush strokes. 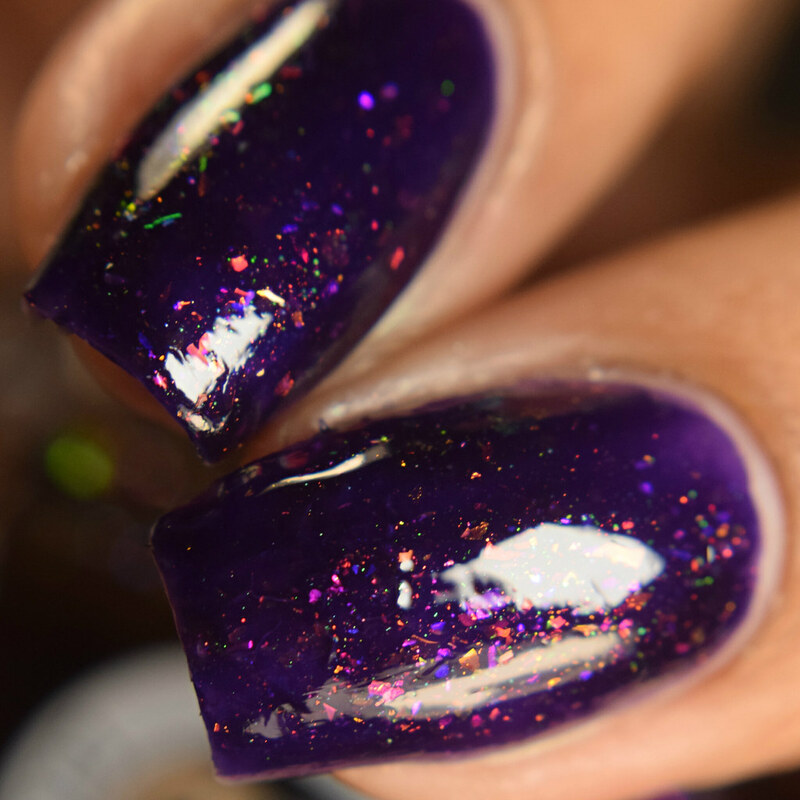 Abjuration – a dark purple jelly with green microflakes and a mix of iridescent flakes that shift violet, pink, orange, gold, and red. Swatches show two coats with topcoat. The one is a rich, deep purple that really compliments the flakes. 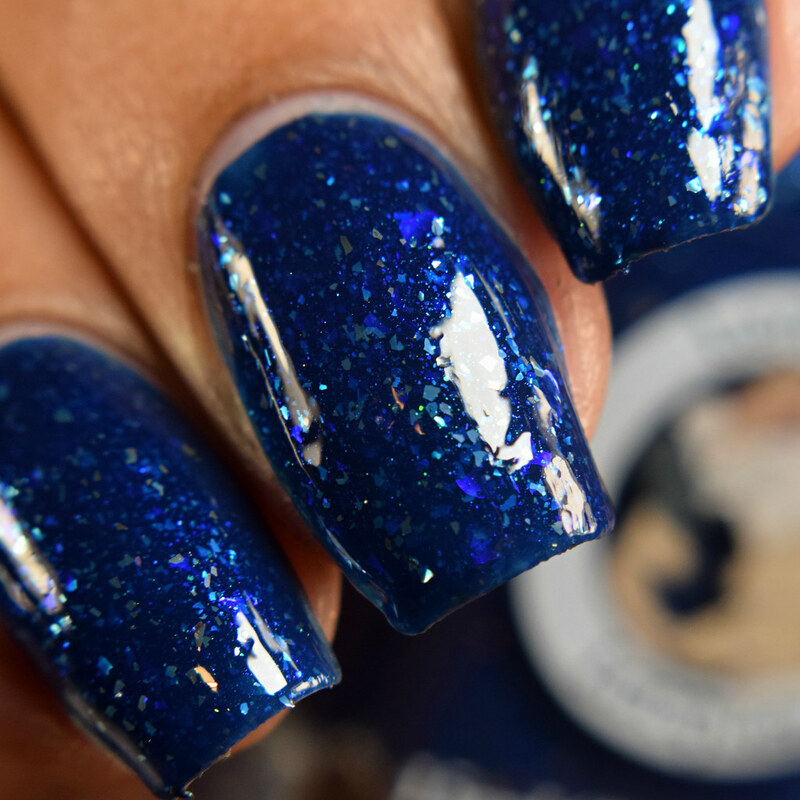 They’re being shy in my swatches but in person this beauty is loaded with them and you’ll see sparkles all over the place. They appear in all the warm colors of pinks, oranges, golds and reds against the base and laid down flat during application. No texture after topcoat. Divination- a raspberry jelly with iridescent flakes shifting purple, blue, turquoise, red and pink. Swatches show two coats with topcoat. This beauty is so pretty! The base is a true red (to me) with a raspberry undertone that will flatter just about any skin tone in my opinion. It’s loaded with flakies and they appear in purples, blues, turquoises, and pinks. 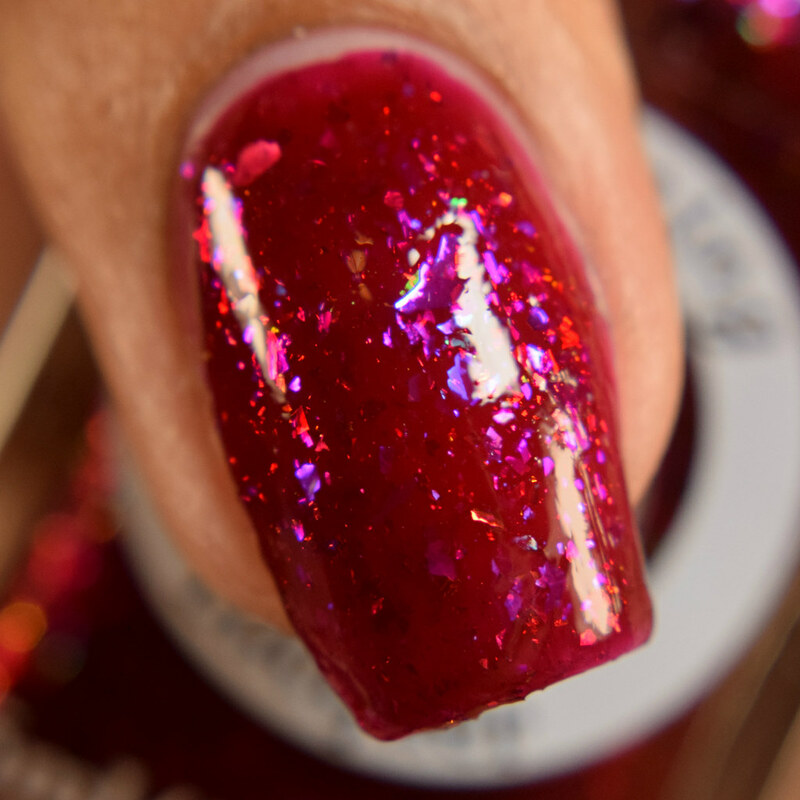 They give lots of sparkle and lay down flat during application. Formula has a super jelly buttery feel, just like the others in the collection. No texture after topcoat. 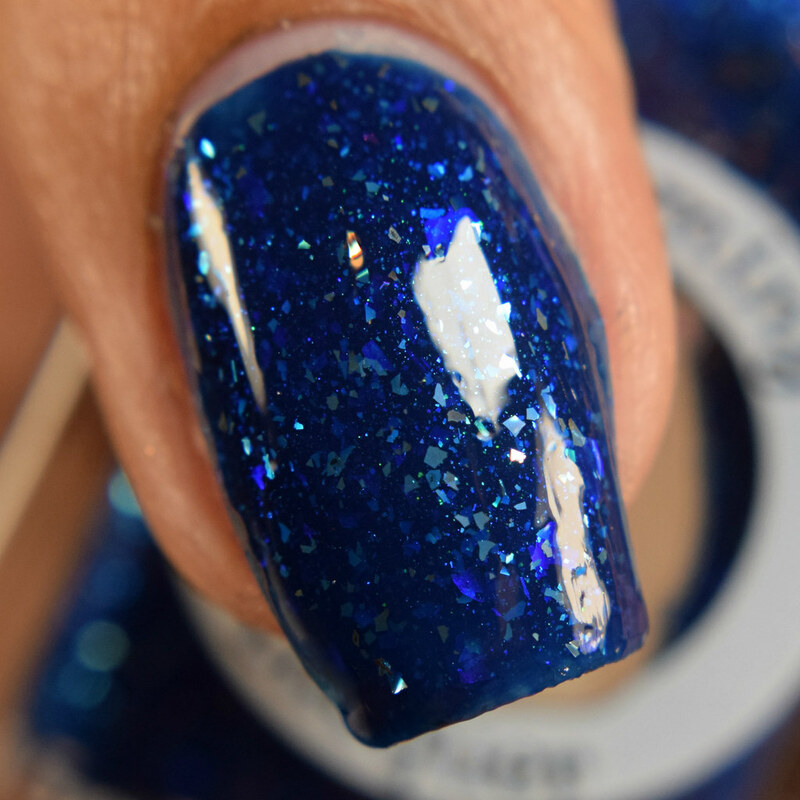 Illusion- a winter blue crelly with cyan shimmer, purple/blue iridescent flakes and silver metallic flakes. Swatches show two coats with topcoat. This one feels just a touch more opaque than the others in the collection. Formula has the same buttery feel, and builds easily. The flakes appear as a gorgeous contrasting silver in person, and the iridescent flakes give a background of purples and blues. Blue lovers need this. It’s awesome! No texture after topcoat. Enchantment- a dusty purple crelly with gold/orange/pink microflakes and purple/pink/orange iridescent flakes. Swatches show two coats with topcoat. This one has a similar feel like Illusion, and the flakes strongly contrast against the base. My swatches are leaning a touch neon, so be sure to check out my swatch video to see the color accuracy. 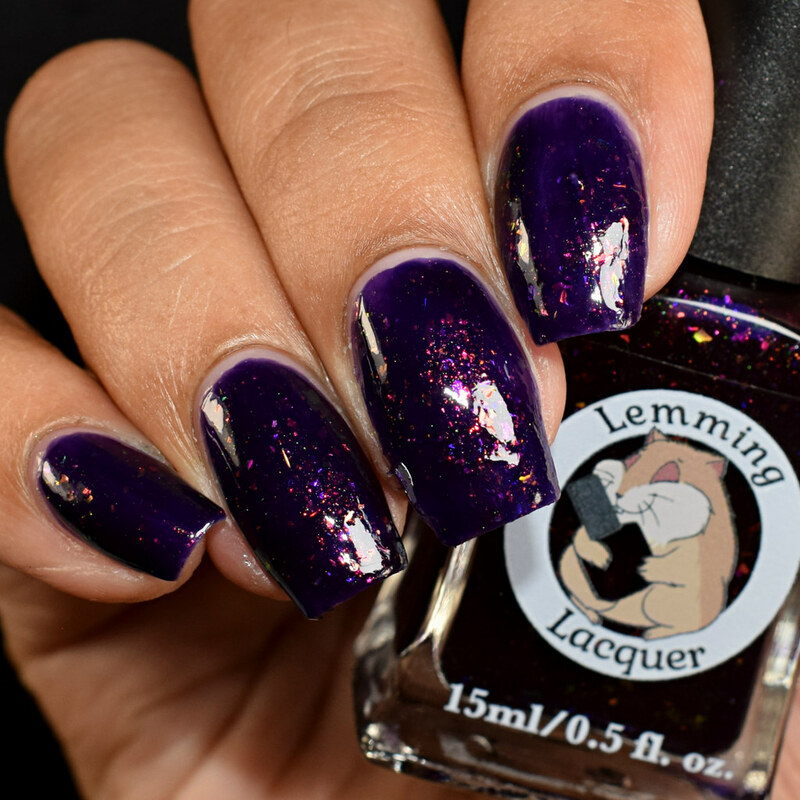 The base is a gorgeous vibrant purple, this is another one of my favorites for this collection. No texture after topcoat. The Schools of Magic collection is available NOW on the site! For black Friday through cyber Monday, the collection will automatically be 10% off! If you spend more than $20, you can get 20% off on everything else in the shop! Use code: IBCBF2018 Grab them while they’re hot! Normal prices for Necromancy and Transmutation are $11, and the others are $13. If you get the collection, there’s free US shipping. Take advantage of that sale ya’ll! Also check out the swatch video to see these beauties in action!